The HTC Magic (the world’s second Android phone) has been on the market for a few months now in Europe and just recently went on sale in Canada. We have all known for a long time that T-Mobile U.S.A. would be launching the device some time this summer, but it seems as though we have been waiting for an eternity. Finally, last night, TmoNewsrevealed that T-Mobile will be issuing a press release this coming Monday with details on the new HTC made handset. 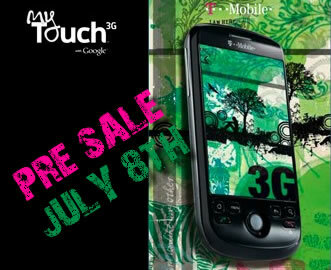 No price or launch date yet, but it appears that the T-Mobile myTouch 3G will be available for pre-sale starting on July 8th. I’m not sure that I’m ready to update to a new Android phone that is simply a redesigned G1, minus a keyboard, but I’m sure there are a lot of T-Mobile who will be completely satisfied with the new myTouch 3G. Tagged with HTC, T-Mobile, android, linux.